There are customs and rituals that people have in common no matter when or where they live. That is true with the customs relating to a couple’s being engaged to be married. Engagement could be defined as a promise to marry and also the period after a proposal, but before marriage. The amount of time for an engagement may be brief or lengthy. The longest have taken place in cultures in which the parents arrange a future marriage for their children many years before the children are old enough to marry. It is not clear just when the practice of giving an engagement ring began, but it may have been in ancient Rome. Some historians trace the history of engagement rings back to when a bride’s family gave a dowry and a groom’s family usually paid a bride price. In any case, the custom of giving a gift of precious jewelry to signify an important commitment is ancient. In centuries past, engagement rings were made of every metal from iron to gold. While many were set with no gems at all, others had a variety of precious and semi-precious stones. A style of engagement ring that is growing in popularity is “Create Your Own Ring.” This system allows the customers to, first of all, choose their own setting. Platinum, 18K yellow gold and 18K white gold are available. After the setting is chosen, the shape of the center stone is selected. The cuts available include: Round, Princess, Emerald, Asscher, Marquise, Oval, Radiant, Pearl, Cushion and Heart. Classic, Modern, Glamorous, Natural, Antique and Halo. Price ranges are $0 – $499, $500 – $999, $1000 – $1900, $2000 – 2900, and $3000+. It can promote the use of Canadian diamonds, as opposed to conflict diamonds. These rings can also use ethically-sourced sapphires and recycled gold and platinum. Namibian diamonds that were mined, cut and polished using fair labor practices can also be selected. Customize any engagement ring in the company’s portfolio to reflect their own taste. Submit their own design for consultation and a price quote by e-mail. Visit the company’s design studio in Arizona to design their own engagement ring in the Kirkawa Ultimate Virtual Design Center. With this option an award-winning team of artists and goldsmiths make your ring to your exact specifications. Satisfaction is 100% guaranteed. This is a unique way to select and purchase an engagement ring. Some people like it, because they will feel that it reflects their own taste and because no one else has a ring exactly like theirs. Designing or customizing your own engagement ring is one possible way to go about selecting the perfect ring for you. The customer must be prepared to spend several thousand dollars if any of these options are chosen. This is one of the most expensive options for purchasing a ring. This company also offers the best quality diamonds in a business model that offers unusual choices. The company has been named Forbes Favorite Online Jeweler for the fifth consecutive year. It has received a 5-star rating by diamondhelpers.com. Blue Nile offers the “Create Your Own Ring” option. 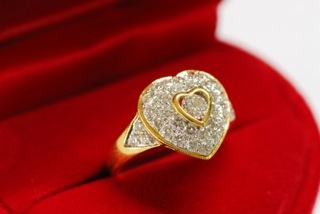 It also has hundreds of different engagement rings ready for sale. Prices vary from $660 to several thousand dollars. This company can provide one of the lowest costs for this important purchase. Blue Nile is unusual in that customers can secure and use a coupon that entitles them to a 5% – 10% discount off the cost of the ring. This is accomplished by using a coupon code and complete information that can be found at www.retailmenot.com. Blue Nile offers free FedEx shipping on rings and a generous return policy. The next two “Types of Unusual Engagement Rings Available Today” are specific kinds of engagement rings available for those with special desires. A Disney-inspired engagement ring can be special for some brides-to-be. This beautiful new line of rings was just released the spring of 2010. It features six engagement rings, all inspired by the princesses in Disney stories. The names of the rings are the names of the heroines in the Disney stories: Sleeping Beauty, Snow White, Cinderella, Ariel, Belle and Jasmine. The maker says, “Subtle references to the personalities of each princess can be seen throughout the collection, such as pave and millgrain borders, suggestive of Cinderella’s ethereal grace and charm, or baguettes and clean lines for Ariel, symbolic of an art deco influence and her bold individuality.” Each ring costs from $4380 to $5460. There are wedding bands to match each one. This is a high-cost choice for the person who has had a lifelong love for the Disney stories. These rings can be found at www.disneydreaming.com. Another possible choice is a Jewish engagement ring. These are made with many different designs. They are sometimes engraved with a single verse from the Bible. The most popular one is, “I am to my beloved and my beloved is to me.” This quotation from King Soloman’s Song of Songs is done in Hebrew. These rings are often decorated with a red thread in the design. The Kabala says each ring should be round on the inside to symbolize the continuing importance of marriage, but square on the outside to represent the home. The Jewish style engagement rings are growing in popularity. Prices vary drastically, based on the ring chosen; but for those for whom the faith element is important, it can be the most meaningful type to purchase. It is important that an engagement ring fit properly. It is important, but it is not difficult to determine a person’s correct ring size. There are several ways to do it. Blue Nile and many other online jewelry stores will send a ring sizer free of charge to those who purchase from them. A ring sizer can be printed from the Internet. Simply compare a ring that the person already wears on the proper finger to the ring sizer, being sure the inside of the ring matches the outside of the drawing. It is simple to do, once you see the chart. Go to a local jewelry store, and they will determine what the proper size is. You can ask her mother, sister, best friend or whoever might know to tell you what your fiancé’s ring size is. Go to the clearance section of the website of jewelry stores in the local mall. The stores often dispose of excess inventory this way. Shop online for an engagement ring on Internet websites that you have investigated to be sure they are reliable. You may find coupons that will save money. Frequently, there is are special discounts on online purchases. Engagement rings are often cheaper online than at a store. Use a cashback website. They will pay you back a small portion of your entire purchase if you click on a link that passes through their website. If you live in a large city, there may be a jewelry outlet store in your area. Jewelry outlet stores sell engagement rings at cheaper prices than what you usually pay in a regular store. If a man knows a woman well enough to want to spend the rest of his life with her, hopefully he knows her tastes and what most likely will please her. It is not a decision to be made quickly and requires much thought. How much the prospective groom can afford to spend must be factored into the decision. Many couples choose to go together and jointly select the perfect ring. This method of selection does away with anxiety about making the best choice of ring. Many grooms prefer this method. The man can take his fiancé’s mother, sister, best friend or someone else to advise him and help make the selection. The engagement period can be one of the most enjoyable times of life as a couple prepares for their wedding and life together. All the time spent in selecting and purchasing the perfect ring can be a very significant part of that. The search for an unusual engagement ring can be one of the most enjoyable activities.